"This is a no-brainer. You can either cook these on top of the range or throw them into the oven on a low temperature. Serve with white rice." Sprinkle pork chops with steak seasoning. Brown both sides in skillet. After the pork chops have been browned, remove them from the pan. Pour into skillet one can of beer. Stir around the beer until all the particles on the sides have been incorporated. 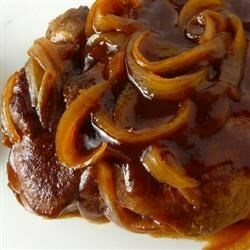 Pour in barbecue sauce and place the pork chops back into the pan. Add onions and cover. Simmer on low for 1 to 2 hours. It was so nice to have some different way to prepare pork chops. I really enjoyed how tender they turned out and the unique flavor of the onions!